More Jobs for Inkjet. Opportunity Grows with Cutsheet Inkjet. Cutsheet inkjet technology is closing the gap between cutsheet electrophotographic (EP) capabilities and continuous inkjet. Customers request quality printed products. Advancements in printheads, media compatibility, and ink sets all play a role in cutsheet inkjet’s ability to provide this. Technology has changed to the point where a number of applications are now possible on these machines. This includes high-end direct mail pieces, transactional statements, books, commercial printing, and some forms of packaging. Above: The Fujifilm J Press 720S delivers offset-quality brand work like pocket folders. United Mail got its start in 1980. Today its two locations—Louisville, KY and Cincinnati, OH—employ 350 staff members. The company services the full communications lifecycle—from data management to print production all the way to presort. Its customers include healthcare providers, insurance companies, fast casual eateries, government contract work, marketing and advertising agencies, higher education, retail, and financial services. In 2017, United Mail purchased its first color cutsheet inkjet device, an Océ VarioPrint i300 from Canon U.S.A., Inc. Prior to that, it offered monochrome variable inkjet printing as well as roll-to-roll laser printing, but found clients requesting more color for this type of work. “It became a challenge with existing technologies and outsourcing didn’t seem right to us. So we got to a tipping point in customer demand for color and cutsheet inkjet was the solution,” explains Dayna Neumann, EVP, business development, United Mail. The press’ ease of use, size, reliability, and variability meets all of United Mail’s requirements. In addition, the Océ VarioPrint i300 satisfies the needs of its customers. Everything and anything is run through the printer, according to Neumann. This includes postcards, self mailers, brochures, and statement work. There is a high level of variability when it comes to projects. Different quantity breaks for each job are common. With the printer, United Mail has grown its customers’ job volumes as well. It takes on larger runs while offering quality output. The company averages 4,200,000 impressions per month and 1,050,000 impressions per week. Neumann points out that the company finds the color quality of the Canon Océ VarioPrint i300 to be particularly advantageous. “There is a big difference in color inkjet today. Gone are the days of banding and saying no when a client wants a specific color. The Océ VarioPrint i300 is a workhorse and can run anything and run it well,” she continues. With United Mail equipped to handle all aspects of a customer’s communication stream, the Océ VarioPrint i300 is another tool that allows the company to take a project from idea to printed piece. Founded in 1974, OBRIEN Insurance Solutions serves insurance clients out of Bartlett, IL. 95 percent of the applications produced are regulatory documents, premium notices, cancellations, endorsements, declarations, and polices. According to Mike Mulcahy, COO, OBRIEN, the company’s goal is to act as an extension of its clients’ businesses. It works as the middleman between the insurance company and IT, handling the data and presenting it in a professional way. In 1995 its first monochrome digital press was purchased. The addition of digital allowed OBRIEN to transition from static to variable communications. Around 2016, the company decided to bring color inkjet into its print offerings. This was driven by a client who was looking for more flexibility and dynamic color—something not possible with its existing portfolio of printers, shares Pete Mier, director of business development, OBRIEN. It turned to RISO, Inc., specifically the ComColor X1 9150 and ComColor GD 9630 models for speed, quality, small footprint, and reliability. “We have tight SLAs with our clients and cannot afford to be down. The RISOs provide the speed and reliability for us to meet and exceed client expectations,” says Mulcahy. Both printers are similar from a production perspective. Mier explains that a lot of the work OBRIEN completes is repetitive, meaning one job has many drops throughout the year so after the first drop, the production team knows the best printer to send it to and the ideal paper type. Many files are handled on a daily basis—and quickly. For example, the company may receive files at night and by 5:00 p.m. the next day they are out the door. Despite advancements in printheads, media compatibility, and ink sets to enable higher quality output, there are still challenges. For one, choosing the best substrate for each job presents learning curves, as print quality varies. Mulcahy admits there is a lot of trial and error when it comes to deciding on the right stock. OBRIEN works with Boise paper and has its own branded stock that has been tested and works best in its production environment. Also, says Mulcahy, ripping the file on the front end, paper jams, and jobs cutting out in the middle of the run are all issues that OBRIEN has worked closely with Impact Networking—the dealer it purchased the RISOs through—to overcome. If the printers go down, Impact is there in under an hour. This type of response allows the OBRIEN team to focus on production and not technical maintenance. Cutsheet inkjet still has limitations and it’s made OBRIEN more aware of the importance of educating clients. For example, flooding pages with ink is expensive so certain applications can be costly and that may be difficult for a first time user of inkjet to understand. The same can be said when it comes to designing with a bleed. Many clients come from an offset background, explains Mier, so they need to be taught that offset to inkjet isn’t a literal one-to-one replication. “This points to our business model. We talk to the owner at the insurance company and they have a small print shop in house. It’s hard for them to keep up with printing and the technical aspect. We take that off of their plate and leverage our expertise,” says Mulcahy. United Mail and OBRIEN’s experiences with cutsheet inkjet are common. Largely familiar with offset, or EP, most print providers have kept a watchful eye on inkjet’s advancements in quality over the years. Quality is achieved through a combination of components. This includes enhancements to printheads, media handling options that increase substrate compatibility, and ink sets. “To achieve the quality level we see today requires the integration of cutting edge technologies—inks, screening algorithms, color management, printheads, and even the wavelength jetting technology the printheads use,” says Ed Pierce, product marketing manager, Fujifilm North America Corporation, Graphic Systems Division. In particular, printheads have gone through physical changes. “Today’s Pagewide printheads have many more nozzles per inch than in the past. Not too long ago, 600 dpi printheads were state of the art. Newer manufacturing technologies have led to higher resolution printheads,” shares Gianluigi Rankin, director of product marketing, Memjet. For example, Memjet’s current printheads feature a native resolution of 1,600 dpi. This resolution—when combined with much smaller drops than in the past—allows for a higher quality print with sharper text and smoother transitions in images that rival offset. “As a general rule, inkjet print quality begins with the resolution of the printheads, but perhaps depends even more on the media and inks as well as color management and process controls on the press,” adds John Santoli, global product manager, Xerox Brenva HD Production Inkjet Press, Xerox Corporation. Paper manufacturers represent an important group in the shift to inkjet. “The key is the brightness level of the paper. The brighter and whiter the paper, the better the image. And where we once needed a 32 lb. or heavier paper to keep inkjet from bleeding, today a 24 lb. works fine,” suggests Andre D’Urbano, director, dealer, sales and corporate marketing, RISO. 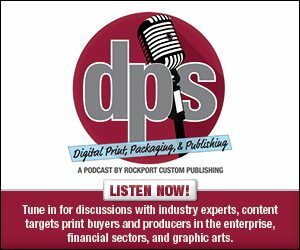 Sheri Jammallo, senior advisor, marketing, production print solutions, Canon Solutions America, agrees that media options have come a long way, allowing print providers to use offset uncoated, offset coated, inkjet treated, and inkjet coated papers. “The advancement in quality comes with the wider substrate flexibility of UV LED inkjet. The ability to print on an expanded range of substrates beyond paper has allowed for a wider, achievable application base,” explains Scott Robertz, product manager, digital, Komori America. And then there are the ink sets. “From its inception, inkjet has been notorious for bleeding into the paper it is printed on. The end result is crisp black turns into dark gray as the ink bled into the paper. Also, it made duplexing very challenging as the images from the front and back page would turn into a blur. There have been great advancements and much of it stems from the improved quality of ink,” explains D’Urbano. At RISO, a resin similar to the compound found in nail polish or lacquer is added to the ink. This allows newer RISO inks to harden much faster than previous versions. Admittedly a balancing act, D’Urbano says this newest iteration reduces bleeding and improves image quality. In the future, he believes ink will bleed so little that it will resemble toner. With quality advancements, print providers are testing different applications with their cutsheet inkjet solutions. These include direct mail pieces, transactional statements, books, and packaging. According to D’Urbano, jobs that were once monochrome now benefit from color. “The jobs that are being transferred from toner to inkjet are those jobs that are primarily monochrome in nature but where color is needed for a logo, header, or highlight. It is a business color, a splash color, a communications color for documents like bills, invoices, manuals, exams, course material, forms, numbered NCR, and other low coverage applications including envelopes,” he continues. Applications that make the most sense for a cutsheet inkjet platform are generally printed on plain papers such as transactional statements, books, and manuals, as well as those that require a variety of finished sizes such as booklets and direct mail. “These applications are time sensitive and therefore produced in shorter runs and are designed using lower area coverage styling—making them an ideal candidate for the low run costs associated with inkjet,” shares Santoli. Transactional printing is using cutsheet inkjet more frequently. “The overall print process is simplified. Instead of printing black text on pre-printed forms, the printers can print all content on white paper, reducing inventory costs and turnaround times. With these new solutions, printers can also expand services to color transpromotional printing as well as direct mail,” says Rankin. High-end direct mail is another target for cutsheet inkjet. Pierce notes that historically, high-end brands requested top quality direct mail pieces, which required an offset device to produce the expected quality level. “Today, cutsheet inkjet’s quality level is easily met while the print provider see a profit due to the ability to address a run length that has been ever decreasing and also adding the variable and personalization factors,” he suggests. “Sheetfed inkjet allows printers to switch easily between different substrates and produce vibrant color at affordable prices—so from postcards to catalogs or promotional materials, direct mail can certainly benefit from sheetfed inkjet,” agrees Jammallo. Publishing is another area that benefits from cutsheet inkjet. “We are seeing books as a growing application. The affordability of inkjet and ability to run cost-effective shorter and variable runs on sheetfed inkjet makes this prime for book printing and one anticipated area of growth,” says Jammallo. At Fujiiflm, there is specific interest from the folding carton segment of the industry. “This is driven by a couple of main influences. The short-run folding carton segment is growing. This is driven by SKU proliferation, local and regional product packaging, and boutique businesses needing short runs but also high quality and matching reprints, commerce as well as variable data, or personalized packaging. The growth is also due to the quality we can now deliver and the large color gamut that can be achieved with a four-color press,” shares Pierce. Advancements in cutsheet inkjet technology mean more work for digital printers. The quality coming off of the latest cutsheet inkjet equipment today is miles away from what it once was—targeting new applications and markets.